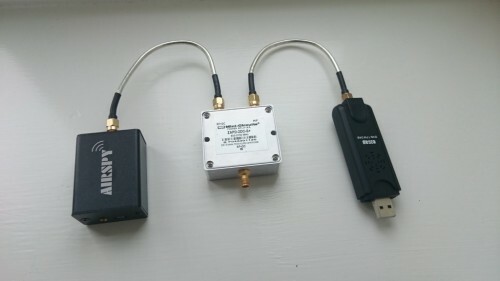 With the recent release of ADSBSpy, an ADS-B decoder for the Airspy software defined radio, many people have been wondering how much better the Airspy is compared to the low cost RTL-SDR dongle at ADS-B reception. Over on his blog, Anthony Stirk has performed a test comparing an E4000 RTL-SDR with the Airspy. In his test Anthony uses an A3 ADS-B antenna from Jetvision.de, and a HABAMP which is an LNA plus 1090 MHZ SAW filter. To create a fair test he used an antenna splitter and measured the reception of both dongles at the same time. He ran one instance of ADSB# for the E4000 RTL-SDR, and one instance of ADSBSpy for the Airspy over 24 hours and recorded the results. The results showed that the Airspy had approximately 50 km more range compared to the E4000 in some areas. More interestingly the stats showed that the Airspy received approximately 7 million more ADS-B messages compared to the RTL-SDR. While there is no doubt the Airspy will perform better, one thing to note about this test is that it used an E4000 RTL-SDR which is widely considered to have inferior performance at the 1090 MHz ADS-B frequency when compared to the R820T/2 dongles. Might not be a completely fair test. The E4000 has a tuning gap approx 1100-1250 and ADS-B is 1090. Many of the E4000 tuners don’t pick up ADS-B at all and I suspect many others don’t get very good reception so close to the gap. This test needs to be redone with the R820T and R820T2 dongles. I agree as most of us use the R280T dongles. As for comparison the Airspy has been produced for SDR and ADSB but the RTL2932/R280T dongles were made for DVB-T, DAB, analogue tv reception. Whoever found out that we could use the dongles for SDR and ADSB is a genius!